Stones were wet when picture was taken. Rough stones measures between 1.9" - 2.8". 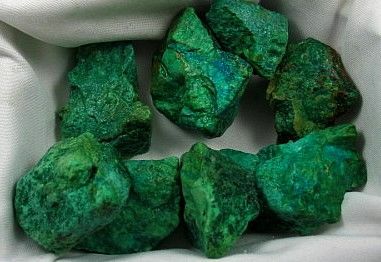 Chrysocolla is a beautiful turquoise blue copper based mineral that is closely related to malachite, and often forms in combination. Chrysocolla acts like a balance scale, can act to stimulate the mind and relax the emotions at the same time. It reacts upon your analytical and intuitive abilities. Together its energy influence alleviates emotional confusion while expanding your mind to new awareness and understanding. Chrysocolla opens bottled emotions that can block the mind from thinking clearly, and is a good choice for a stone when you have difficulty expressing your feelings.